Think messing with a good steak is sacrilege? 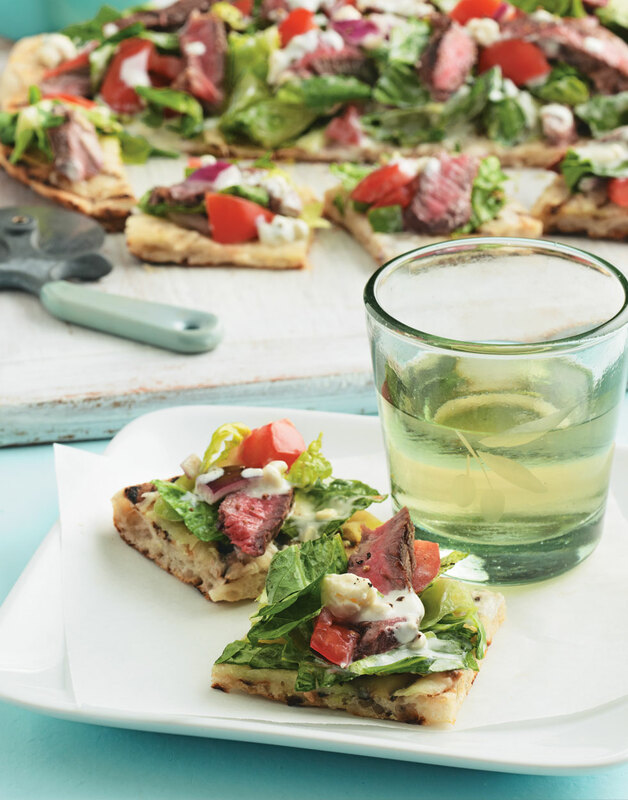 One bite of this savory, garden-fresh steak pizza will change your tune. Tomatoes and crispy romaine make this pizza an ideal summer dinner, but it’s good any other time of year, too. Mozzarella melted over stone-baked pizza dough serves as a base for the fresh toppings and sliced steak. For a creamy element, and to serve as a sauce, top the whole thing off with tangy, Chunky Blue Cheese Dressing. Use your favorite homemade pizza dough recipe, purchase fresh dough, or simply use a prepared pizza crust. Brush steaks with oil, then season with salt and pepper. Grill steaks, covered, to desired doneness, 3 minutes per side for medium-rare. Transfer steaks to a cutting board and let rest 5 minutes before thinly slicing against the grain. Dip dough in flour and roll into a 16-inch round. Lightly brush dough with oil and season with salt. Grill dough, covered, 2 minutes. Flip dough, sprinkle on mozzarella, cover, and grill until cheese melts and crust blisters and crisps, about 2 minutes. Top crust with romaine, tomato, onion, and steak slices. Drizzle pizza with Chunky Blue Cheese Dressing. A light layer of mozzarella between the crust and vegetables helps keep this pizza crust crisp. To prevent the lettuce from getting soggy, drizzle the dressing on the pizza right before serving.